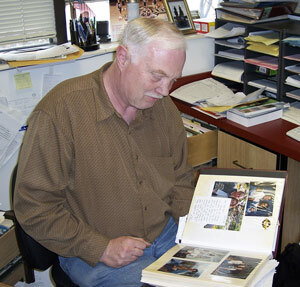 Coach Dave Paur has been coaching the women’s basketball team at CEU for 16 years. Before Paur came to CEU, he coached at several different schools. Graduating from Granite High School in Salt Lake City, he spent his first few years out of high school in the military. He served in the U.S. Army from 1966-1969. He served with the 198th and the 11th Infantry brigade in South Vietnam. He starting his college career playing basketball for CEU in the early ’70s under then coach, Curt Jenson. His first year his team won 10 games, but his team went 17-14 his second year. He shot 43 percent from the floor and averaged eight rebounds and 15-points per game. He was named all-conference honorable mention. He then spent two years playing for Southern Utah University where he earned his bachelor’s degree and continued to the University of Utah where he earned his master’s degree. Coach Paur started out his coaching career at North Layton Jr. High School where he coached football and basketball from 1975-1977. He moved and coached at East Carbon High School, where he coached both the football and basketball teams, as well as the track team. After East Carbon, Paur moved and started coaching at a school called Chowchilla, in the San JuaquinValley in California. He coached football where he was a defensive coordinator, and men’s basketball from 1980-1982, where they took the League Championship in both sports. In 1982 he started coaching men’s basketball at King’s River Community College. That team had but one winning season in their history, back in 1949. They had also lost their last 99 out of 100 games. By the third year coach Paur led King’s River to the Conference Championship Game where they ended up taking second. While at King’s River he was also an assistant track coach He coached there until 1985. After coaching King’s river for three years, he went back to Chowchilla High School, where he coached men’s basketball,and an assistant football coach. Chowchillais where he first started coaching women’s basketball as he helped the team from 1985-1989. In 1989 Coach Paur finally came back to he place where he had played his collegiate basketball. He has been coaching at CEU for 16 years to date, and plans on staying here for the rest of his career. He said that his goal is to win a regional championship and to get a team into the National Tournament. He also said that he wonders what it would be like to coach at a school that had lots and lots of money, but that he likes the idea that most of the players come from this area. Coach Paur said he was proud of the team this year because they never gave up. They kept a positive attitude throughout the year, and that makes him excited about next year, simply because they have all positions on the court filled but one.